This is the first year we are homeschooling our children. Our reasons are many and like everyone’s life choices, so unique I hesitate to even bring them up here. 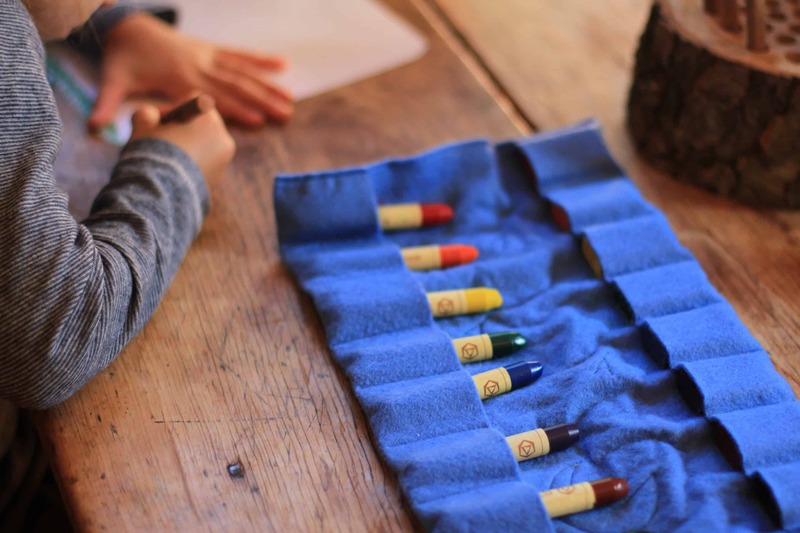 I will say we are not whole-heartedly committed to homeschooling for years to come but we did decide that if we were ever going to try it, the time was now. Waldorf-Inspired Homeschool lesson plans are hard to come by and I for one, am always searching for ideas and inspiration. So, I thought I’d share in this space once a month what we’ve been doing. My younger children (3 and 18 months) are following the Whole Family Rhythms Guides. These guides were born out of my own desire to create a strong and meaningful rhythm for my younger children to support them (and me) in my days at home. Full disclaimer here: we currently have the luxury of having both parents at home a few days each week which makes my job immensely easier- having time with the older children on their own while he utilizes the Whole Family Rhythms Guides with the younger two. My eldest daughter has just turned six. She is on the cusp between Kindergarten and Grade One. This year I am introducing main lesson concepts for grade one without too much pressure and only giving her formal lessons 2 days per week. They are both going to Forest School one day. The other days she has free play with her younger sisters. She is taking riding lessons and may begin guitar or piano soon. My son who has just turned eight is also on the cusp between grade two and three. He completed Grade One in Australia at a Waldorf School in December. After a discussion and assessment with a teacher at our local Waldorf School we have decided to formally teach Grade Three this year (with some Second Grade catch-up). We are using concepts and lessons from the Christopherus Curriculum, Earthschooling lessons, pinterest inspiration, local stories, galleries and museums and neighbours to supplement his curriculum. He has also joined a prestigious children’s choir in the city ( a big commitment!) and takes guitar and riding lessons at the moment. Before breakfast (and before school begins) the older children are expected to go outside with their Dad to do the “Farm Chores”. Right now these include filling water tubs with fresh water, mucking out the stalls and chicken coop and leading the goats to pasture. The younger children come out later to feed the chickens and collect eggs. We start the school day with individual grade verses, A Good Morning Handshake and a ‘circle’ that gets us into our bodies through skipping, swinging and singing as well as skip counting forwards and backwards. We borrow some Charlotte Mason concepts including a “Poem of the Week” which we recite together at this time. We sing a few French songs and poems or read a french book to begin introducing French vocabulary. Both children have started Form Drawing in their Main Lesson Books (as well as on a chalkboard, on the sidewalk and in the dirt)- reviewing concepts from previous years or starting from scratch. My Third Grader has started a daily Weather Journal- writing down observations and drawing things as he likes to start. My First Grader is colouring in a leaf from a Weather Tree each day while we chat about what the weather is like outside. My Third Grader is working on Building a Practical Project- right now it is a milking stand for our soon-to-come goats. My First Grader is listening to a few stories from Grimms Fairytales at both rest time and for her Form Drawing Lessons. 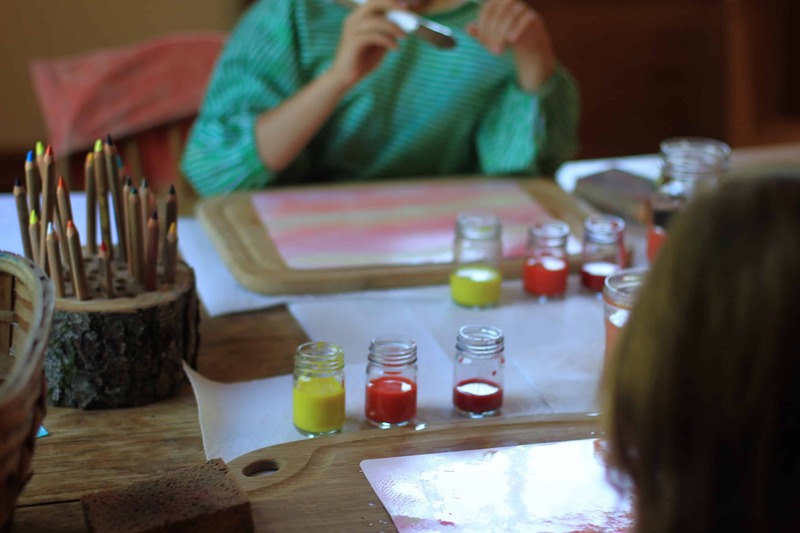 Both children are connecting hearts with hands through painting, modelling, cutting flowers and dying wool and String Games. My third grader does a small amount of math each day- reviewing concepts from previous years. He is now using a large Lyra Pencil for this work. Fridays are reserved for errands, excursions or outdoor activities. This month we plan to visit Pioneer Village (to learn about wool carding, spinning and knitting), visit a local Apiarist (beekeeper) as well as a local Apple Orchard. We are currently reading aloud Farmer Boy by Laura Ingalls Wilder as well as The Dragon Boy Series (to compliment Michaelmas). My third grader is devouring chapter books at the moment. I am having trouble keeping up with him! He has read almost every Beverly Cleary, Roald Dahl, E.Nesbitt, Laura Ingall’s Wilder and Glenda Millard book there is. He’s on to the Harry Potter series which I am hesitant about (because of his age). Any chapter book series recommendations would be greatly appreciated!! I encourage you to take a look at your Family Values and to create rhythms and routines that are unique to your tribe. I share here only to inspire and help you to forge your own family path. Meagan, this is wonderful! Thank you for sharing. We are two years away from Grade 1 but the plan in my head looks so much what you’ve described here~ free flowing, unique to each child, and I also plan to use Christopherus and Earthschooling. Like you I love to research all of this. I will definitely bookmark this post. And how amazing to read how it’s all coming together in your new home! Truly inspiring. Thanks for the positive words Helen! Enjoy the journey- how lucky you have so much time to plan! I wasn’t quite that organized! LOL. Hi Meagan, I am so thankful for your wonderful blog. I’m starting us up as a homeschooling family to my almost 6 year old daughter (and 6month old son). I’m looking at Earthschooling which looks wonderful. Could you tell me what you took from Christopherus? It’s all a little confusing, I’m wondering what the difference is between the two?? Earthschooling is a bit more… earthy LOL. It’s all online and you download the lessons/examples etc. Christopherus is much more “purist” Waldorf and the curriculum comes in binders. I like physically having the binders and I love that they are extremely detailed. Each still requires a lot of prep and planning from the parent to “make it their own”. I spent a good couple months sifting through it all and picking and choosing and adding my own stuff too. Hope this helps. X Meagan. Has he read the Narnia books yet? And Cornelia Funke’s chapter books? My daughter is 8 and I thought the first three Harry Potter were okay for her (she’s very sensitive, but this was not a problem). Maybe number 4 soon. But the rest has to wait since they are too dark and scary, but also too complicated (the story and all people). He hasn’t read the Narnia books yet but I have a feeling he will be on to them soon. I don’t know Cornelia Funke’s books… will definitely look her up. Thank you for sharing Maria! He also read one book from Narnia, some Roald Dahl, too but he keeps coming back to Harry Potter, reading on into Fantastic Beasts and other books. Which Apiary are you visiting? Is it open to the public? Hi Connie, We went to one in Nobleton Ontario. Are you close to there? I would love to know what your homeschooling days looks like now, or more posts like this one! I too would like more posts on how to incorporate whole family rhythms while homeschooling.